Has anyone actually seen an advertisement for iSnack2.0? The “name this product” campaign got a fair amount of air time, so it seems odd that they’d announce the actual name and not have it accompanied by a storm of ads that started at exactly the same minute. Unless, that is, they intended people to talk about the name for a while before they started advertising it. Here’s my hypothesis. It’s largely a post hoc attribution of cleverness to marketing people so it may or may not be accurate, but this is what it looks like to me. Kraft’s plan all along was to give the new product a daggy name that would cause a storm for a week or so after it was announced. But they would carefully distance Kraft itself from the name during that time, to keep the emotional association to a minimum. The name came from a competition in which customers named the product. And the announcement was made with pictures of the winner of the competition. Over time, people will subconsciously blame him for the stupid name instead of Kraft. Obviously Kraft chose the winner from a large pool of entries, so logically the blame is all on them, but brand recognition has very little to do with logic. The image of the daggy guy holding the jar of daggy spread is what people will remember, especially if they don’t do any other advertising to associate it with Kraft – which, from what I’ve seen so far, they haven’t. They’ve even noncommittally acknowledged that the name didn’t go down very well. So here’s my prediction. In a week or two, after most of the hatred has died down, they’ll start a lighthearted and self-deprecating ad campaign, that acknowledges that the name is silly, but it’s still tasty so you should buy it anyway. Bonus points if they use the line “iSnack2.0 – It’s cheesy!” or a variant thereof. The result will be that people will give Kraft credit for being good sports about the whole thing. People – Aussies especially – love a company that can laugh at itself. That, combined with the fact that they didn’t strongly support or associate themselves with the name when it was announced, will lead people to forgive them – it could almost paint them as victims, having to live with the poor judgment of that dork who won that competition, but making the best of it. I’d provide a link, but odds are that you already know what I’m talking about. Which is why it’s marketing brilliance. Don’t get me wrong. I hate the name. It’s awful. It straddles the line between ignorant and patronising, from the youth pastor school of trying to “relate” to a culture that they have no intention of knowing anything about. It follows the management-speak trend of stripping a term of its techical meaning (which is an achievement for “i” and “2.0″ which have very little to begin with) by using it as a wildcard buzzword in contexts chosen at random. In summary, it’s a collection of things that rub me up the wrong way. But if they’d called it Cheesymite, I wouldn’t be blogging about it, Facebook wouldn’t be filled with status updates about it, and it wouldn’t have become a running segment on The 7pm Project. I’m not entirely sure whether the uproar was a conscious part of the marketing plan, but I think there’s a good chance that it was. And regardless of whether it was planned or not, the instant viral memesplosion (yes that is now a word) that has happened over the last few days will be all upside for the new product. Everyone’s annoyed about the name now. That will last maybe a week. People simply don’t hold a grudge against a spread – there are too many more important things to save your vitriol for. Okay, a few die-hard outragees will boycott Kraft, maybe. For a couple of months. After that even they’ll start feeling petty for not buying Vegemite because of a name. In the next few weeks, people will start buying iSnack2.0 for the novelty value. It’ll become an in-joke. Some – or many – of them will discover that they like it. The stupid name will not stop them from buying it again. All of these people are customers they wouldn’t have had otherwise. After a couple of months, the word (and number) will lose its silliness because it’s been heard so often, like a word that you say over and over and over until you forget what it means. At that point, everyone will know the brand; most people will still say it’s silly if specifically asked about it, but they won’t generally be annoyed by it. This is what happened to the Nintendo Wii – at first no one could say it with a straight face, now it’s just part of the vocabulary, and along the way it’s become the best-selling piece of white plastic in the universe. So whether the Kraft marketing team are geniuses or just lucky, I think they got this one right. But I still hate the name. 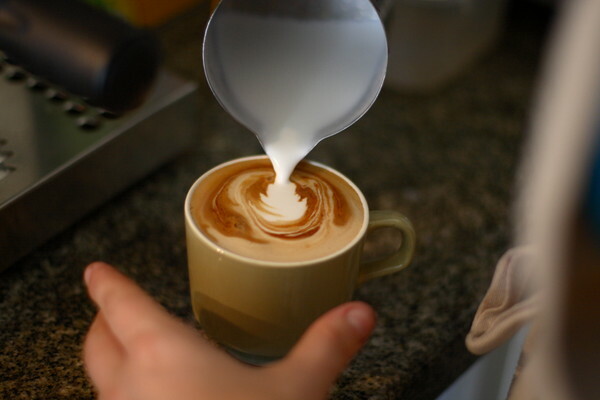 I’ve been an on-and-off coffee drinker for a while – I go through cycles of drinking it and then avoiding it with a frequency of a couple of years. Normally it’s not a strong dependency, and it’s mainly a matter of circumstance when I start or stop drinking it. Lately my coffee intake has been slowly ramping up, to the point where yesterday, when I didn’t have one, I had a faint headache and felt vaguely lethargic for most of the day. So this isn’t good. Gradually decrease my intake over a few weeks. Go with the flow and keep drinking. Currently I’m on coffee #2 for the day, so it’s possible that the third option will win by default. 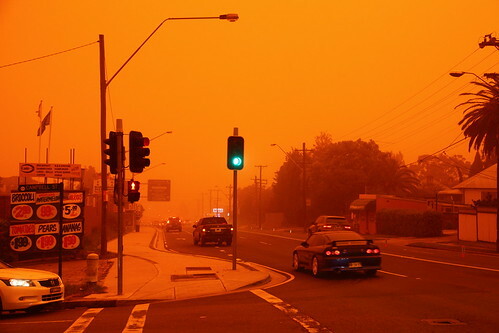 SYDNEY DUST STORM! There, now I’ve mentioned it on Twitter, Facebook, Flickr, my blog and the office whiteboard. Apparently some heavy winds overnight blew the entire colour red from South Australia over to Sydney. Edit: ZDNet used my photo! I’m very slightly famous! So I was going to set up a loop to upload the results to somewhere every 15 minutes or so. But I’ll be out until later today, and it’ll be uploading the same thing every 15 minutes until I get home and stop it. (The bandwidth involved isn’t very big, but let’s pretend for a moment that this is a consideration.) But I want him to be able to check the progress, so making the interval much longer is potentially annoying. I could work out when the process has finished and stop uploading, but let’s assume that I don’t know how to do that off the top of my head (because I don’t) and that I don’t have time to work it out (which I probably do, but I’m blogging about it instead). Then an idea popped into my head out of nowhere: Double the interval every time. This way, it’ll be updating regularly at the start, so he (and I) can check the progress almost in realtime. Then the rate will slow down exponentially so that it’s not uploading all the time unnecessarily. And the delay between when the process finishes and when it does the final upload will naturally be in the order of the duration of the process itself (and in fact will be strictly less than it). And there will be very few extraneous uploads after it’s finished until I get home and kill it. For this particular problem it was probably overkill, but if you change the scale of the problem and remove an easy way to find out when the process has ended or how long it will take in advance, it might actually be useful. It even seems to approximate people’s habits (or at least, my habits) when checking the progress of a long-running process – I tend to watch it closely for a minute or so, then check it occasionally at increasing intervals until it’s done. Is this a known trick? Or does it even make sense? Update: Looks like it’s going to finish just in the nick of time. Still… cool trick, right? Right?